The pH of an aquarium, the measure of the acidity or alkalinity of the water, is one of the many factors that affect your fish's optimal health. Different species have different pH tolerance levels, but sudden changes in pH are dangerous for any fish. Knowing the symptoms of pH shock, and when to watch for it, can save your tank. Commonly, pH shock occurs when a fish is transferred from one tank to another, such as when you bring a new specimen home. Try to measure the pH of your fish's original tank with litmus paper or other test kits and match the pH of your tank as closely as you can to that number. Older tanks can cause pH shock by gradually acidifying outside of your fish's safe range or by causing sudden drops in pH due to loss of buffers over time. Some fish succumb to pH shock immediately. Others may exhibit symptoms including thrashing, darting, gasping, swimming near the water's surface and trying to jump out of the tank. Such symptoms are the same as those that indicate toxins in the water -- either cause is serious. Fish who are experiencing a gradual decline due to poor pH suitability may demonstrate lateral line erosion, poor color and stunted growth. 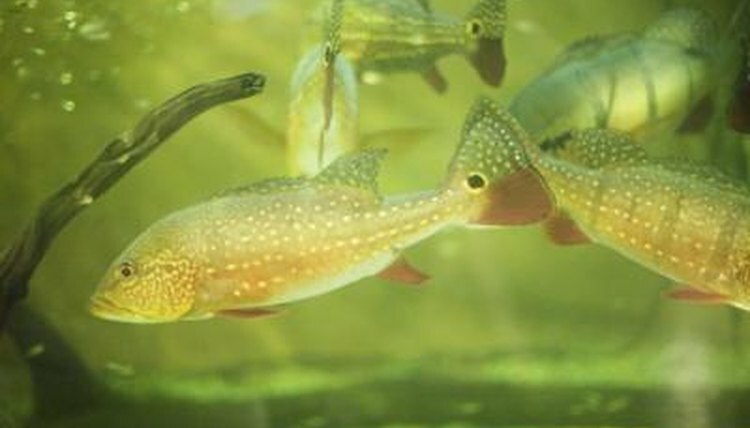 Quickly move a new fish exhibiting these symptoms to fresh water that has been balanced for his species' optimal pH using a kit. If a fish you've owned for longer than a week begins exhibiting these symptoms, bring the pH into the proper range for his species over the course of several days to prevent additional stress. Your goal pH range can vary depending on fish species and on the pH of the interim tank the new fish came from. Freshwater fish generally live in water with pH around 7.4 in the wild, while saltwater fish are accustomed to pH around 6.5 in the wild. Keeping your tank near the ideal environmental pH will help your tank inhabitants thrive. Generally, fish adapt to fluctuating pH as long as they do so gradually, although fluctuations can lead to health problems over time. For example, rainbow trout can live in water with pH up to 9.8 when the change occurs over five days, but 50 percent will die when the change takes place in six hours. If your new fish comes from a tank with unhealthy pH levels, bring him back to a healthy range gradually to prevent shock. In addition, be sure to check the pH levels of your tank when adding a new fish -- even if your older tank inhabitants seem healthy -- they may have adapted to a pH that changed over time to a point that would kill a newcomer.